Want to help out the struggling U.S. Economy? 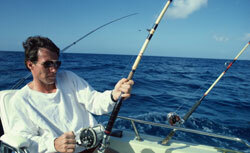 According to NOAA, you can lend a hand by going salt water fishing. According to a new study issued by NOAA’s Fisheries Service, recreational saltwater anglers pumped more than $31 billion into the U.S. economy in 2006, with Florida, Texas, California, Louisiana and North Carolina receiving the largest share. The top five coastal recreational fishing states are: Florida ($16.7 billion), Texas ($3.2 billion), California ($3.0 billion), Louisiana ($2.9 billion), and North Carolina ($2.0 billion). The $31.4 billion in total U.S. expenditures in 2006 contributed $82.3 billion in total sales, $39.1 billion to gross national product, $24 billion in personal income, and supported nearly 534,000 jobs.